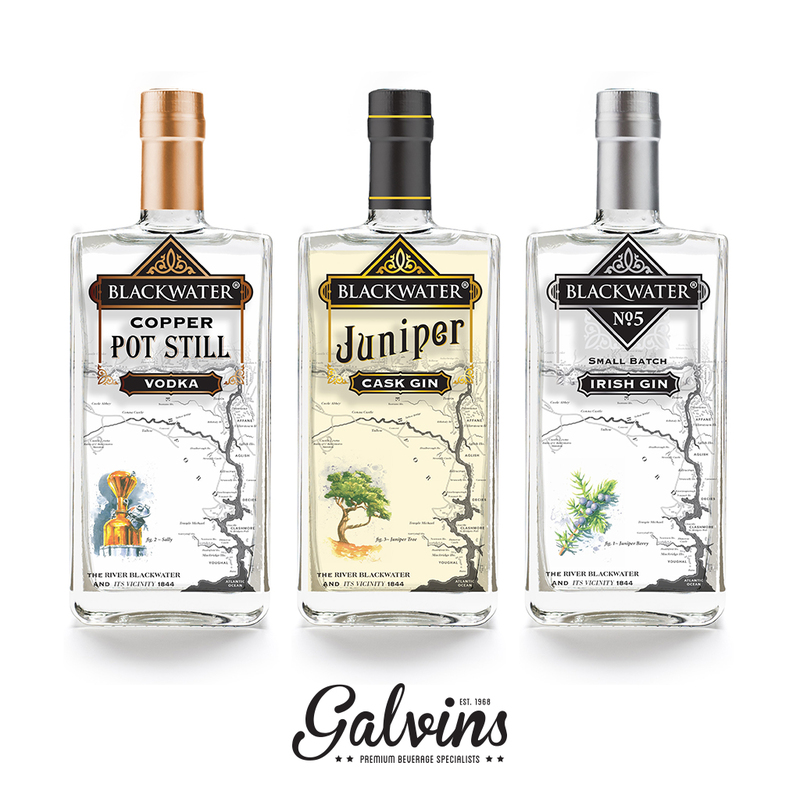 Blackwater Distillery Range | Galvins Wines & Spirits | Distributors of award winning Irish and International Craft Beers and Ciders, Small Batch Spirits and Exclusive Wines. Blackwater Distillery want to make great whiskies and superb gins using the best local ingredients. They’re not a faceless conglomerate; they are real people who have invested time, money and not a little sweat into getting this business off the ground. Everything here is done by hand so they make their whiskies and gins in small batches the old fashioned way – no scrimping, no colours and no flavourings. The distillery is situated on the banks of the beautiful Blackwater River, just outside Cappoquin in West Waterford. With an abundance of clean air, fresh water and plump barley, it’s the perfect setting for Ireland’s newest craft whiskey and gin distillery. Fragrant with juniper and perfume like notes of grass & citrus, warm with plenty of juniper character, the middle is a spicy mix of lemon & Seville oranges with a very long finish of warm liquorice. This vodka gets its creamy mouth feel from its slow distillation in Sally, our copper pot still and never more than 300 litres are made at a time – that’s small batch, which makes it Ireland’s smoothest vodka. The Juniper Cask Gin contains the same 12 botanicals found in the company’s flagship Blackwater No.5 Gin, though here they are in different proportions. The sweeter roots like liquorice are increased so the gin isn’t overpowered by the astringent juniper wood. The result is a straw-coloured gin, complex and aromatic with plenty of character and a wonderful long finish.